A scientific publication from Margaret Buckingham’s research group at Institute Pasteur in Paris identified a new factor that is important for the development of skeletal muscle. During the development of the embryo, muscles are formed from stem cells found in a structure known as the dermomyotome. These cells are specifically defined by the fact they produce a protein called Pax3. Pax 3 has been shown to guide skeletal muscle formation. In this work the authors identified a protein, called Dmrt2, and showed its gene was controlled by Pax3. This linked it to skeletal muscle formation. They demonstrated that Dmrt2 has a role in initiating the formation of the first muscles in the embryo. This study has identified a missing piece in the already known network of factors involved in skeletal muscle development. However, more work is needed to understand if this network is active in the adult and if it is also essential in the regeneration of diseased muscles. What is the idea behind this study and what did the study show? As an embryo develops and grows it forms structures called somites. These are found on both sides of the embryo along the spinal cord. It is the cells in the somites which will go on to form the skeletal muscle tissue in the body and limbs. A special part of the somites (called the dermomyotome) contains the stem cells that form muscle. These cells are defined by the production of a key protein called Pax3. Pax3 is essential for ensuring that the right cells are in the right place at right time, so the embryo forms its skeletal muscle correctly. One of the ways Pax3 has been found to do this is by activating the genes for other proteins (i.e. Myf5). As such Myf5 is called a ‘target’ of Pax3. Myf5 tells the cells to enter the muscle cell programme which leads to skeletal muscle formation and therefore determines their fate. The identification of Pax3 targets is essential to reveal how Pax3 controls the behavior of immature muscle cells and their maturation during development. For this reason, the researchers of the Buckingham group started to look for genes controlled by Pax3 at the beginning of muscle formation. They isolated the cells expressing Pax3 from the somites of mouse embryos and through genetic and molecular approaches discovered that Pax3 directly activates the gene that leads to the production of a protein called Dmrt2. 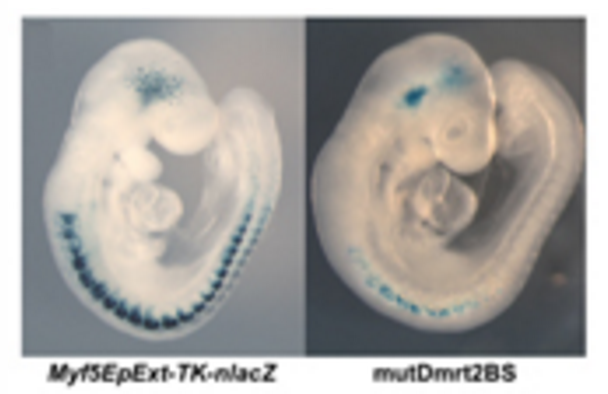 Then, by a series of genetic experiments using transgenic mouse embryos, they demonstrated that Dmrt2 is also essential for the formation of skeletal muscle. In fact, the authors showed that Dmrt2 is a connecting link between Pax3 and Myf5. So, the scientists have identified a new control pathway in which Pax3 triggers Dmrt2, which in turn triggers Myf5 to directing the stem cells into muscle cells. Many muscle disorders (i.e. muscular dystrophies) are characterized by the loss of muscle tissue so the body becomes unable to replace it faster than it is wasting away. The capacity of the muscle to replace itself is called regeneration and this is a normal part of adult life (e.g. in response to exercise). Muscle regeneration is carried out by a pool of stem cells present in the adult tissue, which upon stimuli undergo a series of events that make them change into new mature muscle cells. The events occurring during this process are similar to what happens when muscle tissue is formed during the development of the embryo. For this reason, studying how muscle develops in the embryo (like this piece of research) is helpful to understand how to fix it. Put another way, it is much easier to understand why a car does not move anymore if you know how it has been built and how the broken piece is linked to the rest. In this study, the scientists identified a missing link in the series of complex molecular events that controls how muscles form and work. They showed that Dmrt2 intervenes in the pathway that leads to muscle during its development. However, the function of the Pax3/Dmrt2/Myf5 pathway has not been investigated yet in adult muscles. More experiments will be needed to understand if these factors also govern the behavior of muscle stem cells in the adult. Other remaining questions are: Is Dmrt2 also important for the regeneration of diseased muscle? And can this pathway be exploited to enhance the regenerative capacity of muscle stem cells in muscular dystrophies? These questions are all matters for future research. The full original paper was published in the journal PLOS Genetics in 2010. More information about the group headed by Dr Margaret Buckingham and its research on Molecular Genetics of Development. Funding from the European Community’s Seventh Framework Programme project OPTISTEM supported this scientific work and summary.